(CNN) -- A lengthy investigation into the erratic behavior of a Brazilian accused of ordering the murder of a 73-year-old American nun led to his recent arrest, a Brazilian prosecutor in the state of Para told CNN. 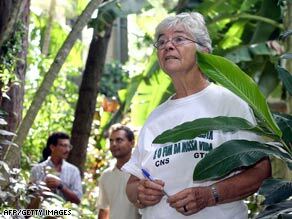 U.S. missionary sister Dorothy Stang as seen in 2004 working in the Amazon forest in Para, Brazil. Regivaldo Pereira Galvao was recently seen at what authorities say is the site of the 2005 slaying of Sister Dorothy Stang to pressure peasants there into giving him the property rights, said federal prosecutor Felicio Pontes Tuesday. The site is located in a 7,400 acre plot known as "Lot 55" that is under dispute in the Amazon. Police arrested Galvao Friday on charges of land fraud and slavery. He is already facing a conspiracy to murder charge in connection with Stang's death. Before her death, Stang had defended the right of landless peasants by giving them access to public land and promoting sustainable farming practices that would help halt deforestation. Her land distribution project, the Project for Sustainable Development (PDS), has received praise by officials with the Brazilian government. "Sister Dorothy's PDS project is the very most successful land reform project in the Amazon," said Pontes, adding, "It has helped more than 300 settlers make a living in a sustainable way.". A recently released film called, "They Killed Sister Dorothy," narrated by American actor Martin Sheen, has won international acclaim for its original, in-depth investigation of Stang's life and the details surrounding her murder. The film contains exclusive interviews and information that will be used against the suspects, Brazilian investigators told CNN. "This film has been very important for us. It not only explains the dilemma Brazilians are facing in protecting the Amazon, but it also contains interviews with the suspects which we will certainly use against them," said Pontes. Aside from Galvao, five people have been accused in Stang's killing. Four have been convicted, and one has been acquitted. Stang was gunned down along a muddy road near Lot 55 as she worked with the peasants. Galvao's presence at Lot 55 adds to evidence against him in the murder case, Pontes said. "We have been keeping an eye on him since he left prison, since he has always said he had nothing to do with that land, and therefore was not behind the murder of Sister Dorothy," Pontes told CNN. "Now we nailed him, we know he lied and he did have a lot of interest in that allotment," he said. Galvao sat in prison for a year after Stang's death while awaiting trial. He was released by Brazil's high court in 2006, though he is still awaiting trial. Galvao has consistently denied illegally obtaining land and being involved in Stang's murder. He has also denied any involvement with Lot 55, which has been divided among poor settlers for Stang's sustainable farming projects. "I'm deeply sorry about this whole tragedy, but I am also a victim of it," Galvao said in a statement from jail after his arrest in 2005 which was posted on a Web site that proclaims his innocence. "I'm innocent. I never stained my hands with any crime, or ordered anyone else to stain theirs." Prosecutors accuse Galvao of forging land titles and forcefully seizing public lands under the government's law reform program. Elizabeth Dowyer, a nun with the Sisters of Notre Dame where Stang was ordained, told CNN she was happy when she heard the announcement of Galvao's arrest. "We are relieved in a sense because we knew he was also involved in slavery and he was an illegal land grabber," she said. "We also strongly believe he was involved in a consortium to grab that plot." Dowyer, who also was involved in Stang's land reform movement in the Amazon, said Stang knew her would-be killers and even prayed for them. "In her letters, she named the people she tried to mediate with. On the night before her death, she invited her own killers who bragged to the community of what they were about to do," she said. "She really believed people could change." The day after the meeting, hired killers murdered her, Dowyer said. Most agricultural lands rest in the hands of a few wealthy landowners, who are engaged in export-crops like soy and sugar cane as well as cattle ranching, according to the Landless Peasant Movement in Brazil.